5 A girl plays as worshippers attend night prayers at Ahmet Hamdi Akseki Mosque in Ankara, Turkey July 14, 2015. 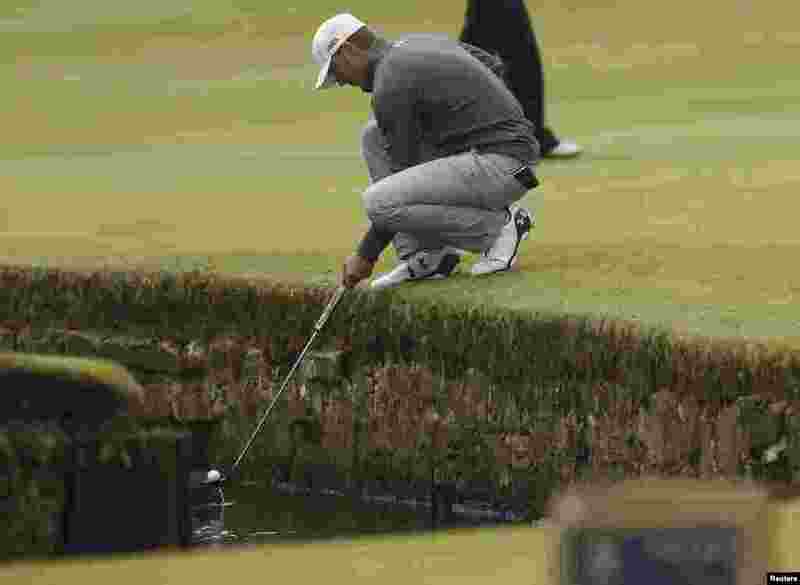 6 Jordan Spieth of the U.S. retrieves his ball from the Swilcan Burn on the first hole during a practice round ahead of the British Open golf championship on the Old Course in St. Andrews, Scotland. 7 A model adjust her hair as she waits for the audition of the upcoming Lakme Fashion Week. The event is scheduled to begin August 26 in Mumbai, India. 8 Fitness coach Peter Yeoman swims in the pool of Gravity health and fitness club in Singapore's central business district (CBD).